My friend is curating a vintage quilt display at our local museum called Warmth Through the Generations. I loaned a quilt top my mother had pieced many years ago. It was tucked away in my cedar chest. I believed it was from the 1930s when she was teaching in a one room schoolhouse out on the prairies of Alberta. The blocks were hand sewn together, then the blocks were machine sewn into a flimsy. I had no idea what the blocks was called, but oh! those pinks and greens. They do make a quilt colourful. When my friend came over last week for our monthly quiltalong, she brought along her Barbara Brackman encyclopedia of quilt blocks. What an amazing book. Inspiration galore. We determined that the block was called the Beacon Star. It wasn’t quite the same as my Mother’s , but, maybe she just added the corner triangles to make it look different. Then, I a get this email…………. “Well serendipity definitely happens. Yesterday I remembered that there was an old notebook in the museum collection that belonged to an old-time quilter…it contained clippings from newspapers and magazines and notes on quilt patterns and motifs. I went in today to add some new labels to the display and decided to pull it out and put it on display. 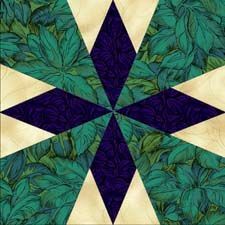 As I was browsing the patterns in the notebook, I came across the exact block pattern of your Mom’s quilt top!!!!!! It is called Key West Beauty, design #692. The lady who put it in the newspaper was called Carol Aimes. And it was in the Evening Telegram newspaper. The notebook is believed to be ca 1930s. And once belonged to a lady called Arlie Evelyn Penrose. I googled Carol Aimes….her patterns were in the Medicine Hat Daily News, Alberta in 1938 and 1940….geese (design # 605) and Scottie dog (design # 722) appliqué’s respectively. Lots of images on Pinterest now that we know the correct name! NOW, I know what the pattern’s name is, approximately what year it was made, and that it was published in an Alberta paper….. All these things confirmed my original story. BUT, something didn’t sit right. In 1938 my mother and father were married down here in Toronto before he went off to WWII. So, I’m guessing she didn’t piece this quilt out in Alberta. Another memory suggests it was pieced in Toronto because Mother was part of a group called “The Stitch and Chatter Club”. I’ll never know the real truth. I should have paid better attention when Mom was telling me the stories. But as a young mother, I had more important things to do…..or so I thought at the time. Now, I’d like to be able to ask her all these things and I can’t. Lovely interesting story. What fun! Thank you. You are so lucky that you have a mother who quilted. How wonderful to find this pattern and its history. What you said at the end really resonates with me because of my recent loss. I never wrote down and talked to my mum enough about stories regarding her family, early life, and leaving England to come here.